I'm finally catching up on spring collections now. I have one of the new Zoya polishes today from the Delight collection. I purchased this one in the Earth Day promo they had last week. 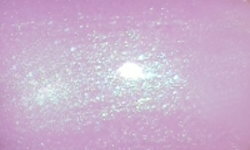 Leslie is pale lavender with a turquoise shimmer. Color: This is a very pale shade of lavender. This is a beautiful soft shade, and the shimmer added is exactly what I've been craving. I love when brands take expected seasonal shades and jazz them up. This particular shade of lavender starts to go into a bit of funky territory for me personally. This is verging on making my skin look a little pekid. The paler the shade the more this happens. I wish this was just a tinge bit darker, but that's just me! Formula: Whenever I review polishes that I find to be imperfect I search other reviews to see what other bloggers thought. All the other reviews of this polish I came across loved the formula on Leslie. This makes me nervous because I did not love the formula. I found this formula to be a little thick, runny, and didn't want to level on my nail. This was not the case for other bloggers, so you may not run into any trouble. That being said, the formula was far from bad, but not what I was expecting based on other reviews. Overall: Leslie just isn't all there for me. It's exactly the type of shade I'm drawn to, and the shimmer is something I have been waiting for in spring pastels. I think because I had high expectations for it, I am a bit disappointed. That's not to say you will all be too. Personally, this is just at 80% for me. I just purchased this shade too and ditto on the thoughts. I really, really like it but wish it had been a tad darker. It didn't want to level for me either. I did make it work though with 3 thin coats. Haha! Nail polish collector problems (NPCP). I bought this in the Earth Day promo, too. Still waiting for my polishes to show up, but definitely interested to know if mine has a weird consistency, too. I like the shade of purple this polish is a lot. Glad it wasn't just me! I always get a bit worried I missed something when I'm not feeling a polish a lot of others are. really pretty and perfect for spring!